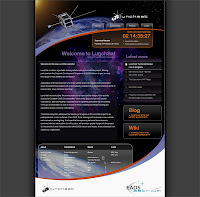 A new website for Lunchsat is on the launch pad! Lunchsat combines a graduate training initiative with a microsatellite project, allowing participants in the Graduate Development Programme of EADS Astrium to gain an early knowledge of how satellites are developed. Appreciation of the development of a whole satellite project is possible due to the scaled down development associated with a microsatellite compared to a standard project in terms of reduced size, lower costs and overhead. Lunchsat has been active for several years and is based on the design of the recently successful Canadian CanX-2 microsatellite. Work on the project is split into several ‘subsystems’, each addressing a separate area of expertise associated with the satellite. Work can be undertaken on one or several of these, enabling knowledge building and experience across a number of disciplines. The Media subsystem addresses the reporting of progress on the Lunchsat project to its participants and a wider audience. From 2008, it has been agreed to develop a new website and overhaul an existing blog. It is hoped that transparency between these elements, combined with the introduction of a wiki system, will provide a greater insight into the project for the benefit of other functional units within EADS Astrium and indeed, those interested from outside our organisation. The address to bookmark for the new site is http://www.lunchsat.eu/.